This is a super-fast, over-the-weekend, sort of project that gets you from cast-on to finished results and final Ta-dah! in double-quick time. 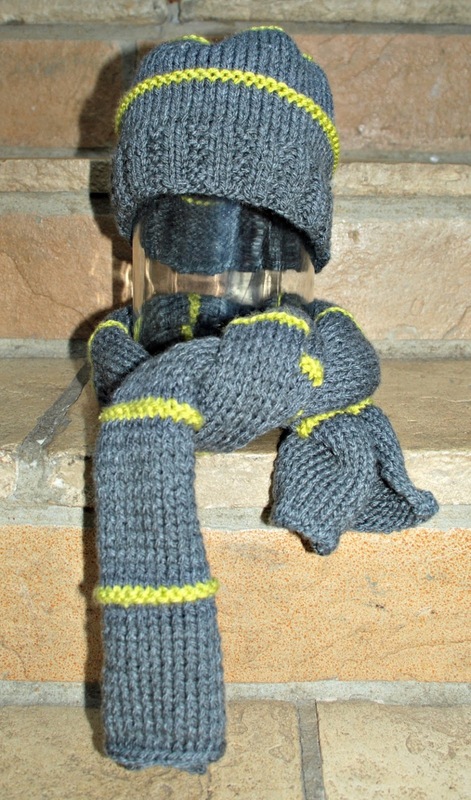 Would you like to see Emi's hat, made to match the scarf that I knocked out for him last week? It's rather cheerful, isn't it? He told me that it was like wearing a hug on his head, which sounds positive. In fact, so happy was he with his new creation that he decided to style it his way and roll up the brim (as shown in the photo above). With that adjustment made, he wore it all day Sunday teamed with a T-shirt, because the weather was really mild for October. I decided that the final contrasting circle before cast-off was a sufficient statement without adding a pom-pom; a bit of my less is more approach. Emi confirmed that this was how he liked it as well, adding that pom-poms were for babies. Anyway, I rather like the understatement in that final circle. 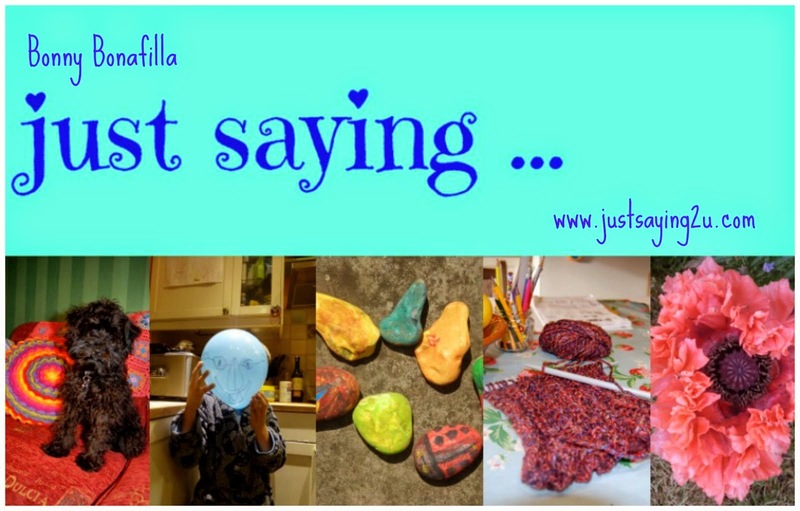 If you 'd like to make it - think about all those Christmas presents that you're going to need to magic up in a few short weeks <panic!> - here's what you need and how to go about it. I used less than a half of a 100g ball of Hayfield Bonus Chunky in grey (shade 0786) and lime (shade 0785), so that's what I decided to use. 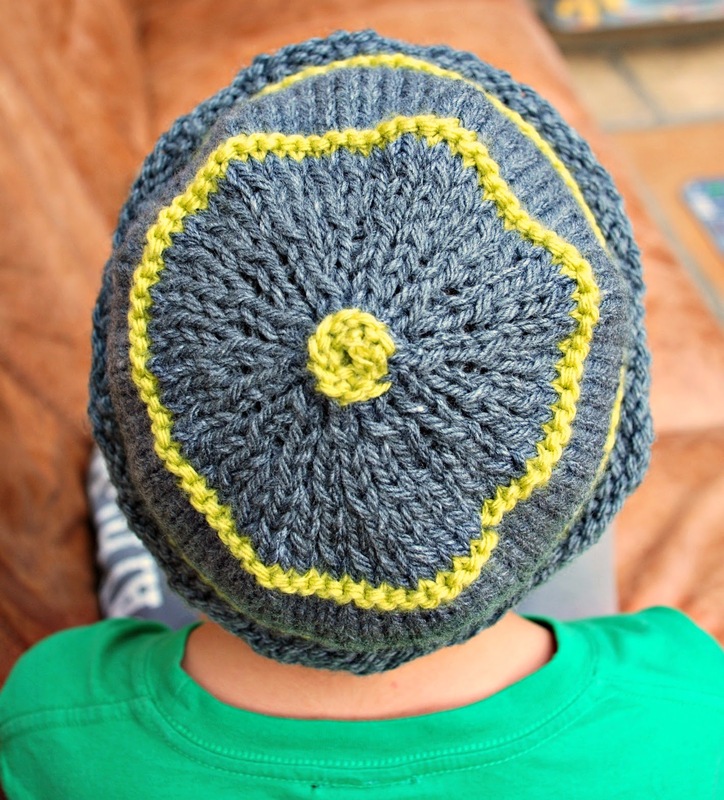 Emi is 8 year's old and the hat was made with a diameter of roughly 50 cm. If you'd like to make it bigger or smaller you can adjust the size by adding or subtracting stitches in multiples of two. Cast on 72 stitches in your main colour (grey in my case) on 6 mm, 40 cm loop, circular needles. First row: Using your first stitch connect both ends of the row, and mark what will be the end of the row with a loop of wool in a contrasting colour. Having done this the first row is knit 2, purl 2 all the way to the end, and that first joining stitch should be a knit stitch, forming part of your first knit 2. You will end with a purl 2. Second row: knit entire row. Repeat these two rows until the ribbing at the bottom of your hat is as long as you'd like it to be, ending with a knit row. In my case I did 12 rows. Knit 10 rows - just plain knit stitch. 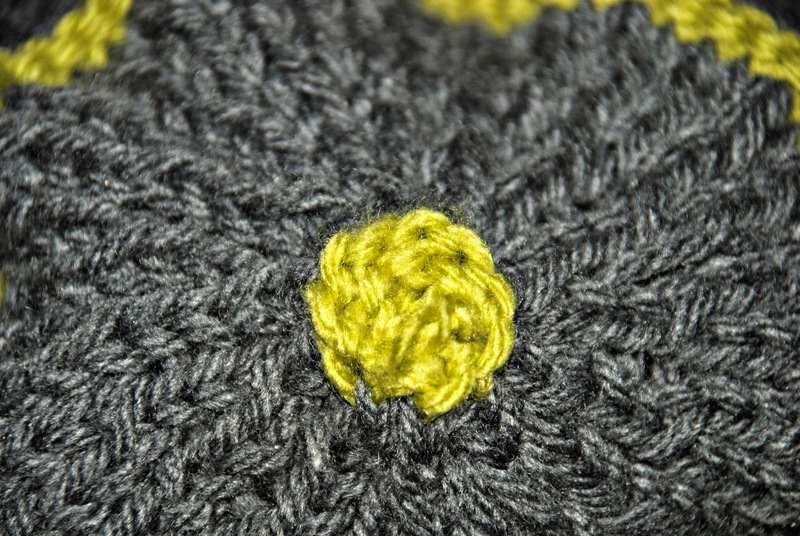 When this is knit in the round, going in the same direction on each row, it produces the same texture as stocking stitch, where you knit and purl on alternate rows, back and forth changing direction at the end of each row. 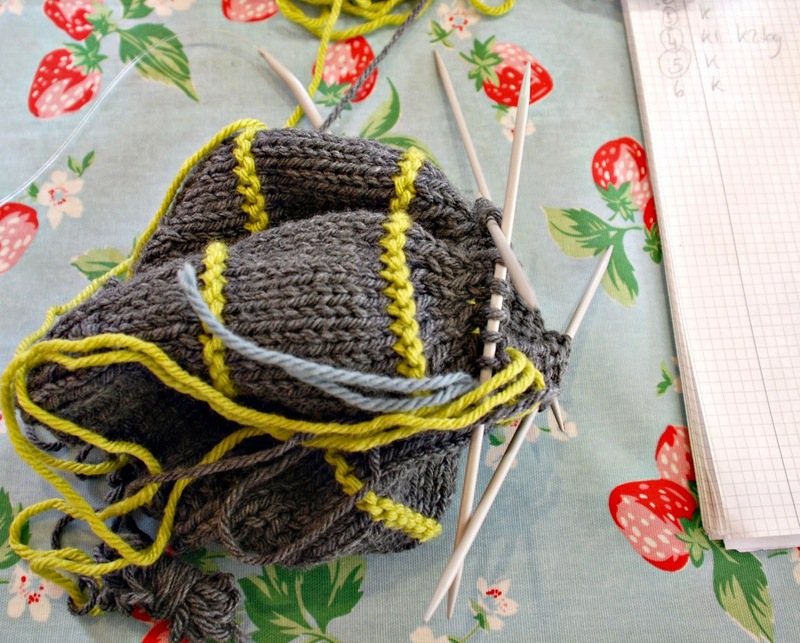 First contrasting row: join your contrasting colour (in my case lime) and knit one row. Second contrasting row: Purl entire row. This will produce the ridge that gives the texture contrast. 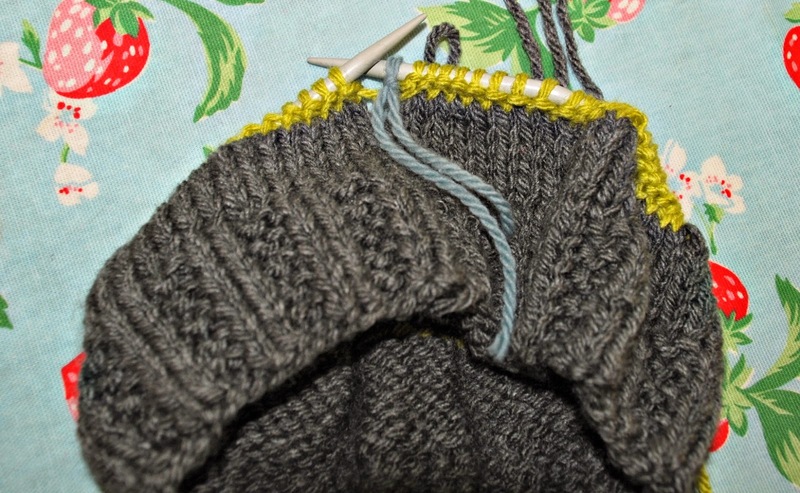 Join the main colour again (grey in this case) and knit another 10 rows of plain knit stitch. Join contrasting colour and add second contrasting stripe by repeating the first and second contrasting row instructions above. Join grey wool again and knit 4 rows. At this point move the stitches from the circular needles to a set of 4, double pointed 5 mm needles. You could use double pointed needles from the beginning. I don't because I have a strong preference for using circular needles that I can fold away and carry around easily in my handbag. I use needles that are smaller to make the decreasing stitches of the crown more tightly woven. If you stay with the same size needle there's a risk that the tension will be too loose because of all the decreasing that's going on. Divide the stitches equally between 3 of the double-pointed needles and use the fourth needle to knit the rounds (as set out below), continuing with the one-direction knitting. Row 1: Knit 2, Knit 2 together to the end of the row. You should finish with 37 stitches on the needle. Row 2: Knit to the end of the row. Row 3: Knit to the end of the row. Row 4: Knit 1, Knit 2 together to the end of the row. You should finish with 19 stitches. Row 5: Knit to the end of the row. Row 6: Knit to the end of the row. Row 7: Knit 1, Knit 2 together to the end of the row. You should finish with 9 stitches. Row 8: Knit to the end of the row. 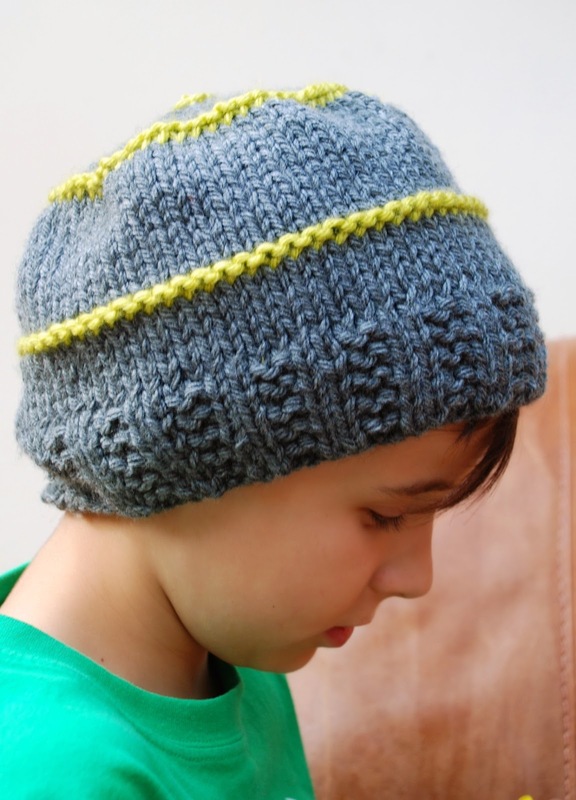 Row 9: Change to the contrasting colour (lime in my case), and knit to the end of the row. Row 11: Purl 1, Purl 2 together to the end of the row. You should finish with 5 stitches. Cut wool, and thread into a darning needle. Draw through the remaining stitches on the needles and fasten off. Darn in the loose ends and you're done. 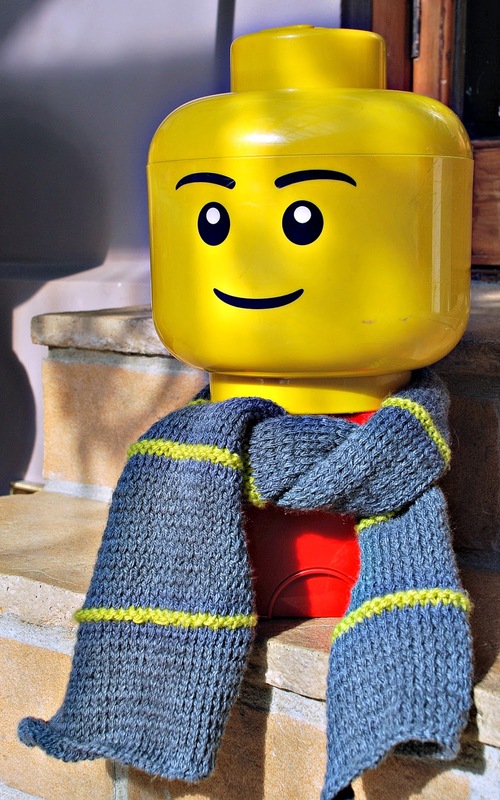 It's about as easy as falling off a log, and you can always combine it with the even easier matching scarf, the pattern for which you can find here: Little boy's scarf pattern.